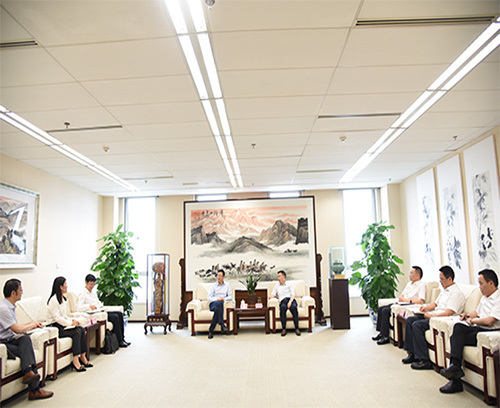 On 28 May, Yu Bin, Chairman of the board of directors of China Power, conducted a site investigation and inspection in Sichuan and met Tan Yongxiang, general manager of State Grid Sichuan Electric Power Company, in order to exchange views on the cooperation between the two parties. In the morning, Yu Bin was briefed on the work done by China Power's subsidiaries in Sichuan, knowing more about the operation of the enterprises and the progress of relevant projects. In the afternoon, Yu Bin visited Sichuan Electric Power Company to exchange views on the cooperation between both parties on integrated energy field. Tan Yongxiang, general manager of Sichuan Electric Power Company, welcomed the visit of Yu Bin and expressed her gratitude to China Power for its support to Sichuan Electric Power Company over the years. She hoped to enhance the cooperation ties with China Power for a win-win relationship. Yu Bin said, the cooperation between Sichuan Electric Power Company and China Power is in the interest of both parties for a long term and can enable them to complement each other with the advantages they possess so as to achieve a mutually beneficial and win-win situation. Relevant persons in charge of the Electricity Sales and Integrated Energy Department, Capital Department, Chengdu Office and Chengdu Integrated Energy Company of China Power also participated in the site investigation and inspection and the meeting.